How Much Does It Cost to Host a Website for a Year? (2018) Read this First! January 14, 2018 October 1, 2018 learnanetLeave a Comment on How Much Does It Cost to Host a Website for a Year? (2018) Read this First! I mentioned in the beginning that this question of how much does it cost to host a website for a year is very broad being that there are hundreds, if not thousands of web hosting providers around world. So I want to be honest and state up from that we don’t have time to cover them all today because it could take an eternity to review them all. Webhostingbuddy listed 100 companies, while hostingkingdom.com had a very extensive list of 500 web hosting services. Again, as I said time won’t allow to examine ALL of these. However, what is important is to know what to look for in a host. How Much Does It Cost To Host A Website For A Year? For the purpose of today’s article, I will only consider 6 web hosting providers that are well know in the industry that I personally recommend. As mentioned before, there are hundreds, if not thousands of web hosting companies so we don’t have time to consider what each charges per year for services. When considering what web hosting cost per year there are a number of factors that you must considers such as plans, features, add-ons or even optional upsells such as Domain Privacy, Sitelock, google indexing services etc at checkout. Bluehost has 3 shared hosting plans: Basic, Plus, Prime [$3.95/month, $5.95/month, $5.95/month] Offers 30 Day Money Back Guarantee! SiteGround has 3 shared hosting plans: Startup, GrowBig, GoGeek [$3.95/month, $5.95/month, $11.95/month] Offers 30 Day Money Back Guarantee! A2 Hosting has 3 shared hosting plans: Lite, Swift, Turbo [$3.92/month, $4.90/month, $9.31/month] Offers 30 Day Money Back Guarantee! Hostgator has 3 shared hosting plans: Hatchling, Baby & Business [$3.95/month, $5.95/month, $5.95/month] Offers 45 Day Money Back Guarantee! 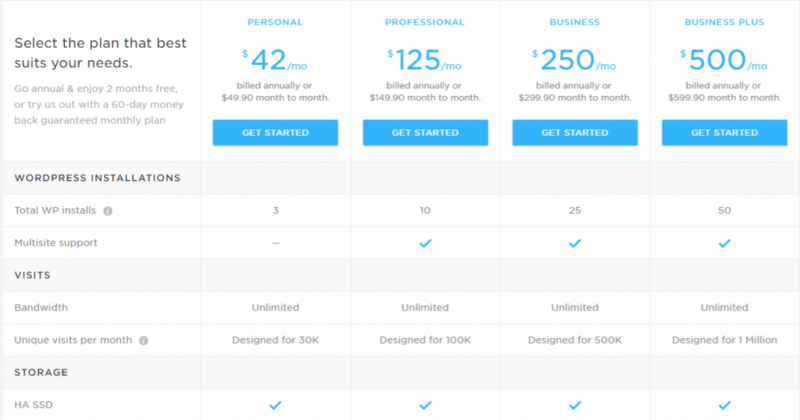 Dreamhost shared hosting plans cost is $11.95/month if billed MONTHLY; $9.95/month if billed EVERY YEAR; $7.95/month if billed EVERY 3 YEARS. Offers 97 Day Money Back Guarantee! Cost – [ $42/month, 125/month, $250/month, $500/month respectively] (2 Months FREE on Annual Plans) Offers 60 Day Money Back Guarantee! Which Web Host to Choose For Your Website? Another factor to determine how much does it cost to host a website for a year is selecting the right web hosting service for your new website. This step is an extremely important decision that should be taken seriously. This is why ALL of the 6 web hosting services mentioned are super reliable and have great uptime on its servers. Reliability and website speed are far more important that web host pricing. People today hate slow loading websites. Also sites with bad uptime are not good either because you actually LOSE money when your website is not online. Amazingly ALL of the web hosts listed above are super reliable, affordable and come with money back guarantees. My personal favorite to start websites for beginners is Bluehost web hosting. They have great 24/7 customer service and very reliable hosting services. They also have a very user friendly cPanel with 1-click easy install WordPress and video tutorials for beginners. Let’s say that you currently host with another provider and want to migrate your website to Bluehost? What steps do you take to transfer it to Bluehost web hosting today? Bluehost is pretty straight forward to transfer and easy to start creating your new websites. If you are ready to get started right now, I recommend that you visit the official Bluehost website below and signup! Visit here www.bluehost.com to signup now! As you can see, I have quite a bit of an overview to help you understand how much does it cost to host a website per year. The main key to buying Bluehost web hosting or any of the above mentioned such as Siteground, A2 Hosting, Hostgator is to purchase your hosting ahead. It’s way cheaper to pay for 12 or 24 months of hosting in full than trying a month to month plan with other hosts. The truth is that you don’t really save any money doing month to month deals. You are actually paying MORE money on the front and back-end by going that way. The yearly cost for most basic hosting plans round about $65 for 12 months term. This figure takes into account that you are not signing up for any of the OPTIONAL AD-ONS or upsells at checkout. You will save a lot of money this way at checkout. However if you do decide to select options such as Domain Privacy which is highly recommended, it will be worth the extra fee bucks. Other add-ons features like SiteLock, Search Engine Indexing are great also, but totally optional as well. Depending on the web host and plan that you select above, if you were to add all of these optional features at checkout, then web hosting could cost an upwards of $170 per year! These are estimated costs for a 12 month shared hosting plan. Either way I think that they are an excellent option to invest in for optimum web hosting services. For More Details Go to www.bluehost.com to Start Your Website! Today, I have done my best today to demonstrate how much does it cost to host a website for a year. As you can see above there are several factors to consider before buying web hosting services from a provider. Hopefully by examining this brief information, you will have a better idea and feel more equipped to start your website with right web hosting company today! Visit the official website of your favorite web hosting by clicking below to start your website today! Bluehost Hosting Deals - Get 60% Off Bluehost Web Hosting! Previous Post Previous post: Inmotion Hosting Review 2019: Best Web Hosting for Bloggers or Not? Read this first! Next Post Next post: WPEngine vs Bluehost Review 2018: Brutally Honest Truth, 400% Cheaper Secret?